Synopsis: When the dead come back to haunt the living, Lockwood & Co. step in . . .For more than fifty years, the country has been affected by a horrifying epidemic of ghosts. A number of Psychic Investigations Agencies have sprung up to destroy the dangerous apparitions.Lucy Carlyle, a talented young agent, arrives in London hoping for a notable career. Instead she finds herself joining the smallest, most ramshackle agency in the city, run by the charismatic Anthony Lockwood. When one of their cases goes horribly wrong, Lockwood & Co. have one last chance of redemption. Unfortunately this involves spending the night in one of the most haunted houses in England, and trying to escape alive.Set in a city stalked by spectres, The Screaming Staircase is the first in a chilling new series full of suspense, humour and truly terrifying ghosts. Your nights will never be the same again . . .
Fifty years ago, a horrifying ghost epidemic began. All across the world, a sudden influx of mean-spirited (excuse the pun!) apparitions meant that walking out at night wasn’t ever safe again. In the wake of this, several “psychic investigation agencies” were formed to protect your safety. But only one is brave enough to enter one of the most haunted houses in England – and unravel the mystery of the screaming staircase. 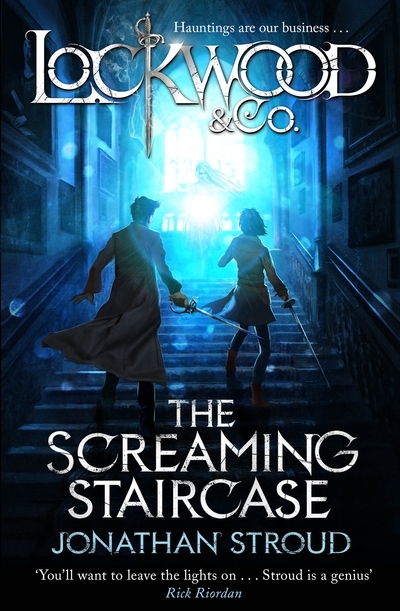 In the tradition of great detective series, Stroud has chosen to narrate The Screaming Staircase from the perspective of Lucy, Lockwood’s sidekick (if that’s a fair descriptor of her job – looking after Lockwood would be a much better term!) In fact, there’s certainly a vibe that Stroud is intentionally evoking a sense of Dr Watson’s narration in Sherlock Holmes as he delves into ever so slightly archaic prose which imparts a sense of timelessness to the narrative. Much like Nathaniel’s London, Lockwood, George and Lucy’s England is similarly unspecific when it comes to pinning it down to a specific era. The fantasy elements exude Victorian (even pre-Victorian) qualities – the eager drive to innovate coupled with nostalgia, and, of course, if there was ever a time for ghost stories it is quite firmly in the late 19th Century – though this is contrasted with the domesticated lives of Lockwood’s gang which almost verges on modern (though there is a distinct lack of mobile phones and computers). 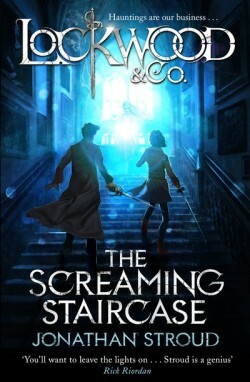 The Screaming Staircase, apart from being blessed with three well-formed funny characters that break the stereotypes so often present in YA and MG fiction, is also refreshingly free of any sort of romance, and even better, the overused trope of a love-triangle. It could have been all too easy for Stroud to include any of these elements, but instead he chooses not to. It’s nice to see a story where none of the characters are particularly obsessed with finding their “one true love” and instead, the focus is quite clearly on their friendships, which are just as sweet as any snog (and undervalued in YA fiction, in my opinion). Lockwood & Co: The Screaming Staircase doesn’t quite reach Bartimeaus-levels of excitement (yet- I have high hopes! ), but Stroud certainly manages to write an engrossing, original tale of three young ghost hunters that plays on Conan Doyle’s legacy and is a great read both for younger teens and older adults.